Rubenerd: Is it a final goodbye for urlTea? Is it a final goodbye for urlTea? UPDATE: I’ve been advised that the reason why urlTea was forced to go offline was due to clients getting sick and electrocuted from trying to brew their computers in mugs. Makes sense to me. 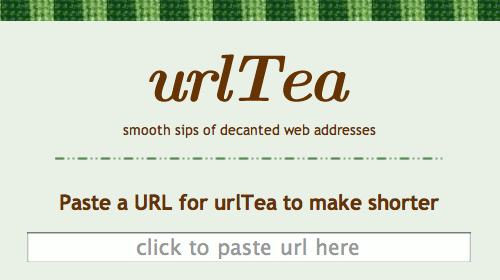 Reading about the latest problems with the tr.im URL shortening service, it got me thinking about urlTea and whatever happened to it. Before the current crop of shorter URL shorteners appeared such as is.gd, bit.ly and the like, TinyURL was king but I liked using urlTea because it was something a bit different and I loved the name! The previous iteration of my blog theme had links to URLtea under each post for well over a year, in fact I still think the icon I used for it is still on my server somewhere. As of April it seems their site has ceased to exist like an infamous Monty Python parrot. If you attempt to visit their site, you're told the site is Temporarily Unavailable and a scary error line warning of a malformed httpd server file (gulp) suggests they won't be coming back anytime soon. Bummer. It's normal for sites to go offline on the intertubes when their owners run out of a combination of time, money and/or interest, but intermediary sites that serve to redirect links pose an entirely new set of problems if and when they're disconnected. It's a bit scary. In the meantime I've switched to RubyURL.com which was the other site I used to use alongside urlTea because it has the same few letters as Ruben and Rubenerd, and at the time I was into the Ruby programming language. Newer post ← Celebrating 1,888 posts! Older post → What kind of Twitter user are you?